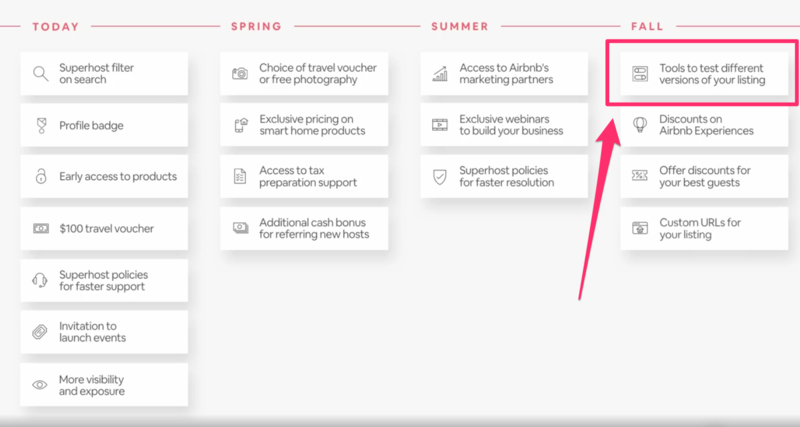 If you were able to catch the latest Airbnb keynote, they announced several implementations of their business plans plus the upcoming roadmap for the year. 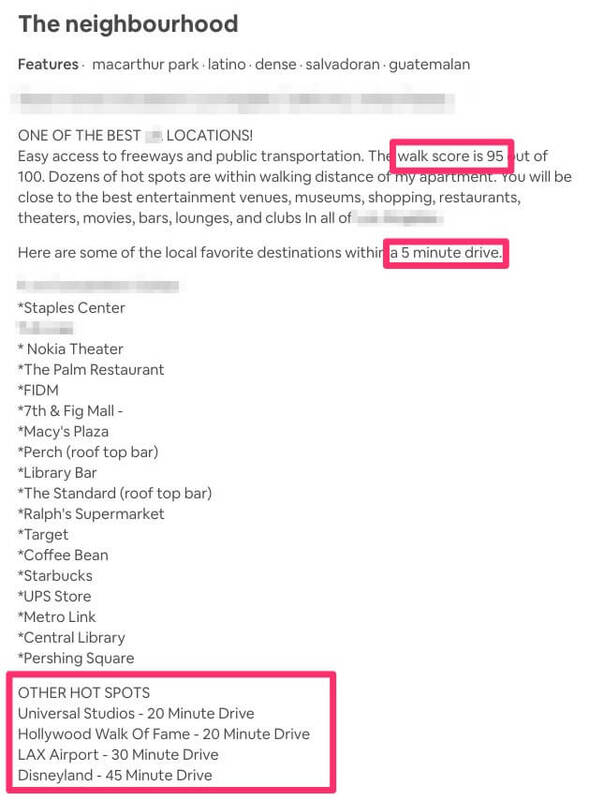 By far the most interesting thing to me was the ability to test different versions of your Airbnb listing. This is essentially called "split testing" by many. You'll need to be a Superhost to get access to the tools, but I'd like to start talking about how to start thinking like an "optimization whizz". You may have noticed things switch around on the platform for a short period of time. It can be fairly obvious like the positioning of the map or things that are less subtle, like the organization of search results. In any case, what you're experiencing is a split test done by Airbnb themselves. Airbnb has mentioned in that testing things and making data-driven decisions is the core of their business. They rely heavily on data to make all major decisions and like most of the major tech companies, they have data scientists working around the clock to make sense of what everyones doing on their platform. Using with this image and their ranking factors found here. I believe the new tool for Airbnb hosts will be a game changer. Especially for those who believe in data-driven hosting too. I don't like to think of us as a number in the whole Airbnb system, but we kind of are and so are our listings. If we learn more about how Airbnb runs internally, the more bookings we can actually drive for ourselves, right? We should always be looking at how things benefit Airbnb first and then see what we can do to manage those metrics on our end. Before I go off the deep end and talk too much about how Airbnb works internally. Below are some ideas for running split tests as newbies. It'll give you an idea for what you can do in the shortest amount of time for the most valuable results. The starting ground for your split tests should be where the biggest differences can be found. Go to the complete opposite of the spectrum. In other words, make big comparisons. For example, if you have a very short listing description try to make a longer one that is far more detailed. Night and day comparisons should garner the quickest results and we'll explain later what places you can split test first. Don't overwhelm yourself and start by brain dumping all your ideas into excel and choose 1 to test for now. It'll make your life a lot easier and the obvious ones you should test will automatically simmer to the top. Unfortunately, more views are needed to increase the quality of your test. So if you've got multiple listings, start with the ones with the most views. If you stick to this rule, you'll be able to find universal themes that you can apply to all your listings. After you've come up with a few split test ideas. Choose the ones you'd think would make the biggest difference for every one of your listings. Figure Out Your Hypothesis - For example, "If my pictures were brighter, then I would get more bookings"
Create a Variant - Take pictures during a sunnier day or bring in some extra lighting. Run The Experiment - 50% of your views are directed to the original listing. The other 50% are sent to your variant of brighter pictures. Measure Results - The three metrics to pay attention to are bookings during that time period, the number of enquires, and your rankings. 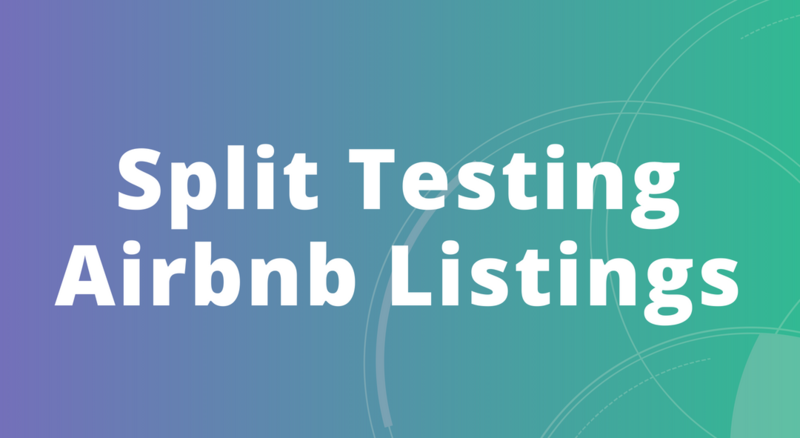 How can we start split testing our Airbnb listings today? Since Airbnb hasn't implemented these tools yet, I think a few of you might be curious how you would start today. 4. Come back again 10 mins before Midnight the next day and record the additional views you received that day, your rankings (you can use Rankbreeze), the number of inquiries, plus bookings for the day. 5. You'll start to see a pattern once the data begins to compound for each version of your listing. 6. Run the test for 4 weeks. 7. Find the statistical significance of your results. You could use this tool from KissMetrics and can simply replace the word 'conversions' for "bookings + inquiries"
Your first 3 photos are your most important. 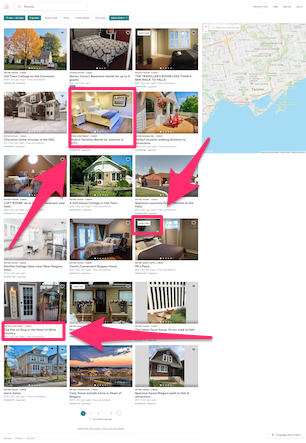 The first one is the featured photo that people will see as the thumbnail for your listing and then the 2nd and 3rd will the ones they see once they've clicked through to your listings page. 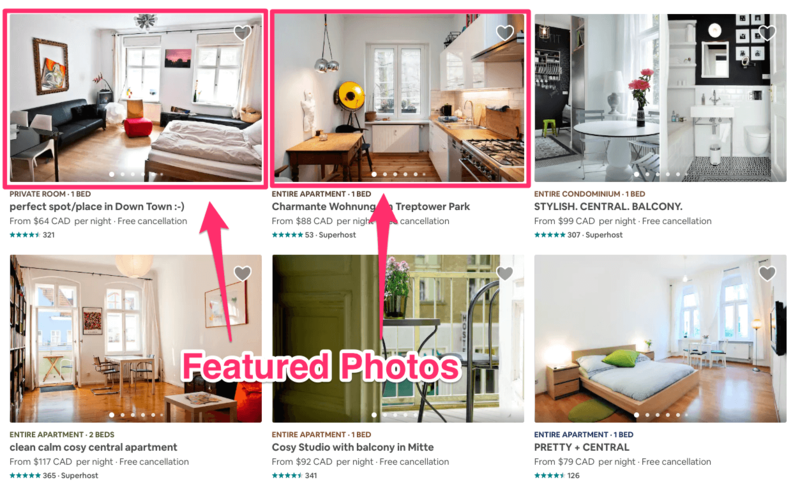 You may not see what I mean by 2nd and 3rd photos because Airbnb is constantly running split tests of their own and this is a version I've seen before. Where the listing page showed 3 photos right away, instead of the first one only. There are tons of different ways for you to trial different versions of your title. You could add or takeaway capital letters, emojis, stars, etc. Download this "Featured Image" pack with 25+ examples of click-worthy photos that are meant to stop guests dead in their tracks and take a second look. We've also included a pack of our favorite emoji's to spice up your title and description. This is the first area that people will start reading on your listing. 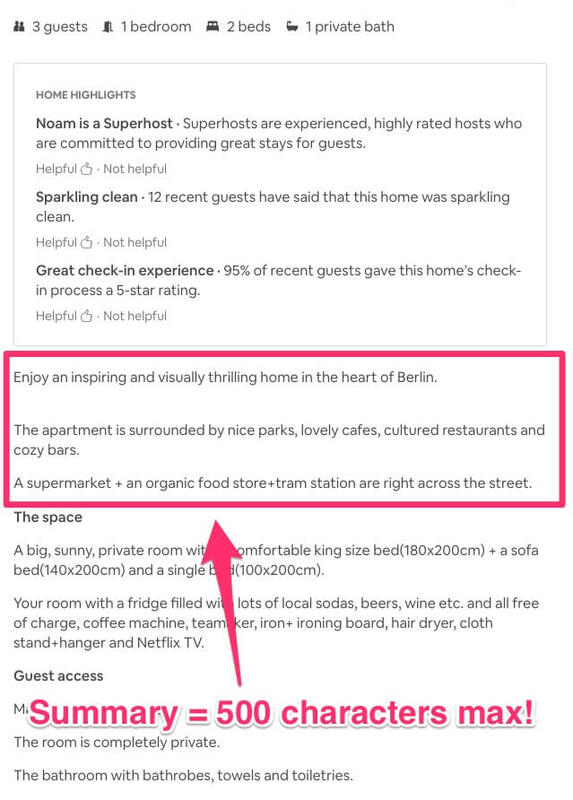 Airbnb makes it incredibly hard to fit many words in there because there's a character limit of 500. I'm sure you guys all know what I mean! 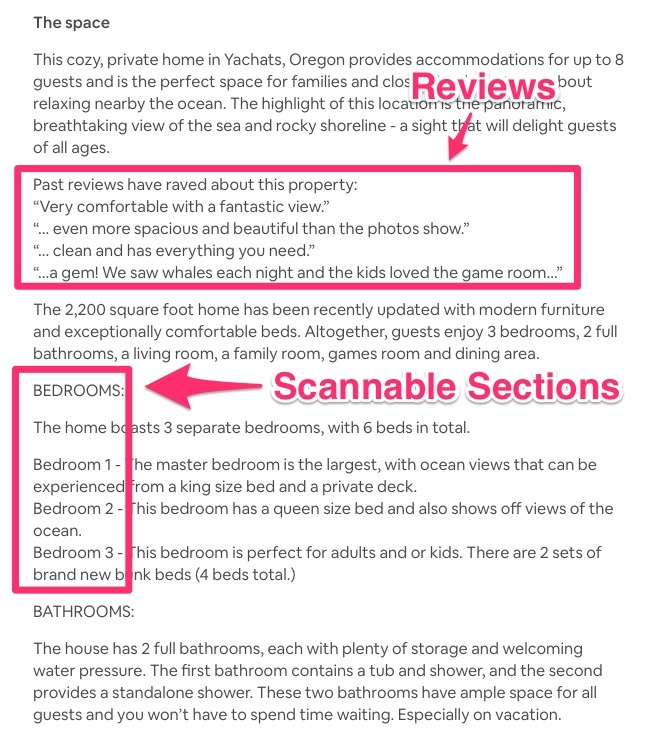 I've seen different versions of Airbnb that have taken away the entire listing description but you could only preview the first 3 lines. Which is why I've mentioned previously to focus on the first 3 lines. When someone first arrives on your listing, they see your host photo right away. Directly under the pictures. So it's important to see if this has any effect on your conversions. People will click your photo and be taken to the bottom of the listing where you can start playing around with your photo and description. 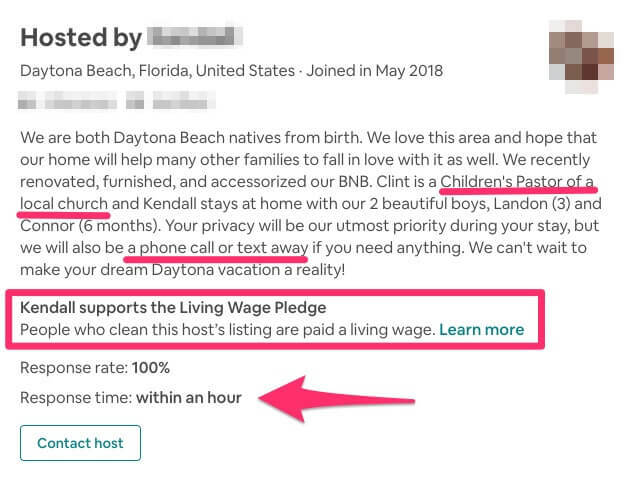 I've seen people talk about causes they support as well, such as Airbnb's living wage pledge. This is also another huge area to focus on. You could play with your listings being short and sweet, long and concise, add bullet points, take them away, create scannable titles, or adjust it according to seasons and upcoming events. I'd say that if you are going to take adjust this area, it's important to do some research as well. For every new listing I've created, there's particular emphasis on reverse engineering what the other listings in the city are doing. This is why we call it the ultimate listing optimization! 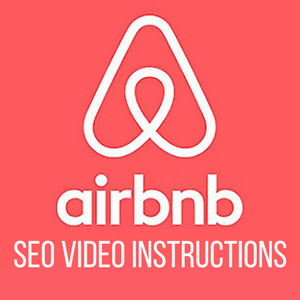 If you'd prefer additional video instructions, we'll give you instant access to our 3 part series on increasing your Airbnb listing's views and booking rates! Just like the rest of the listing descriptions, you can adjust this to be short, long, with bullet points, and highlight different parts of your area. It's essentially part of your overall listing description, but we thought it deserved special attention and could drive more bookings if done right. The split testing tools for Airbnb are only for Superhosts at this time. Which means that if you aren't already prepared to become a Superhost and you want access to the tools, then you'll need to start upping your game or begin a new profile. If you've already canceled one person this year, then unfortunately, cancellations count as a metric for your status and you won't be able to join yet until another reassessment. To get started, regardless of whether you have Superhost status or not, start writing down all the different ideas you have to test and remember the biggest 'apples vs oranges' references above. Test things that are really going to matter on your highest traffic listings. Then apply it universally to all your listings. VIDEO TRAINING TO RANK YOUR AIRBNB LISTING HIGHER!